I don’t know about you, but this Full Moon in Leo (Aquarius Sun) hit me pretty hard. A super moon/eclipse as icing on the cake. Even the heavens are acting up at this point in our active history making era. And while there are many aspects of this history we make to bring out cries, it’s also good to laugh; the joke is always on us! Growing large; stealing my sight. Those three; what was it for? Earth in the middle of the muddle. As a curving line splitting to grin. No crime, just a joke among the three. ©2019, Richard W. Bredeson, all rights reserved. Happy Full Moon in Aquarius! And happy Sun in Leo! 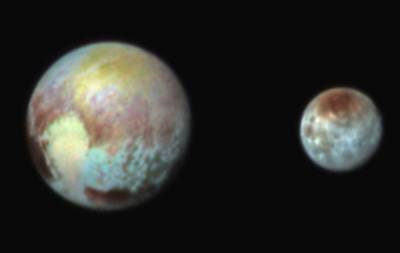 Today’s NASA picture from the New Horizons Spacecraft is Pluto with “his” Full Moon, Charon. Full Moon sets in the West. Awaken now to Golden Days! Yields ripeness to the scythe. Solstice to Equinox half-way through. Long days begin to yield at last. Forget not now these Golden Days! Autumn is fast upon us. Falling leaves remind the time. Cycles within cycles ticking past. Happy Birthday to me! And to Richard! And to Tristan! This is a big weekend for celebrating Leo birthdays in our family. We will have our whole family together to celebrate in Maryland. Exciting times! And the Full Moon was yesterday, Friday, July 31, 2015 at 6:42 am Eastern Daylight Time. This is a time when the Moon in the sign of Aquarius is directly opposite the Sun in Leo. This Sun brings up our personal creativity and the Moon couples that with the Aquarius energy of collaboration for the good of all humanity. When the Moon is Full it is reflecting the most Sunlight that it can. How can you shine your inner light more brightly into the outer world? Are you living your purpose, your mission, your gifts? This is also the time to release what is holding you back from Living Your Richest Life™. Where are the blocks, the doubts, the fears keeping you from your joy? What are the possibilities that you cannot see because something is clouding your view? The planets are lining up in the next few days to support you in reassessing where you are and what the possibilities are for your future. Are you willing to figure out the fears that hold you back and to take that leap forward that you have been waiting to take? Now is the time! Once in a ‘Blue Moon’ you get this opportunity – this is the month with a Blue Moon and today is the day! (A Blue Moon happens when there is a second Full Moon in one calendar month. The first one in July happened on July 1.) The theme of this Blue Moon is ‘how the power of individual intention and the force of collective consciousness combine to create our reality’ – from The Mountain Astrologer. Get your intention lined up with your purpose so you can shine your Light in the world and create the reality you desire! The Leo New Moon is coming on August 14 at 10:53 am Eastern Daylight Time. Get clear about your intentions before then by clearing what is in the way. You don’t want to carry any old energies with you into the generous energy of newness at the next New Moon!